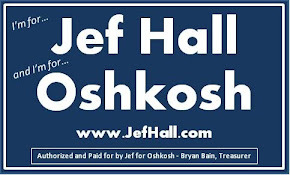 Jef Hall - Oshkosh Common Council: Streetwise (OshNW) Asks: What Does Oshkosh Need? Click here to add comments the the OshNW blog, or add them here. Get all the favorite jokes and jabs out of your system and then take some time to think about what stores, businesses, improvements or enhancements you think would make life better here in Sawdust City. You'd like some examples? Why, we thought you'd never ask! 1. A downtown bakery/deli would be excellent. 2. A basic network of bike paths (even paths marked on existing roads would be nice) that feed into the river walk on both sides of the river. 3. An expansion of the Downtown Business Improvment District to include Oregon Street and Ohio Street. 4. A convenience store of some sort where basic food items would be available. Or a co-op.